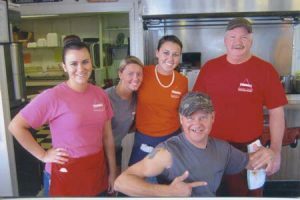 The Turtle Man of “Turtle Man” TV fame was in the county recently and enjoyed a meal at the Triangle in Johnston. He was in the county on a hunting trip with the Welsh family, and Robert Welsh brought him to the restaurant. Pictured are waitresses Maggie Figueroa, Nikki Jackson and Rianna Prince joined by Triangle owner John McDowell.